These full metal jacket (FMJ) loads from Winchester are a perfect choice for training with your sub-compact handgun chambered in .380 Auto. 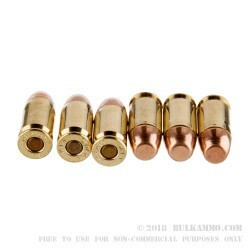 Each round is assembled using a reloadable brass casing, high-energy powder, and a clean-igniting Boxer primer. The 95-grain full metal jacket produces recoil and travel path comparable to the most popular carry and practice ammo in the caliber. Each bullet is shaped for superior feeding and bears a flat nose for magazine clearance. 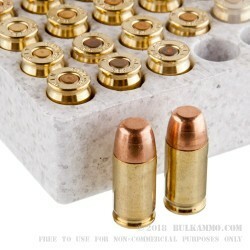 This 1,000-round case is intended to provide you with enough ammo for numerous practice sessions or IDPA BUG matches. 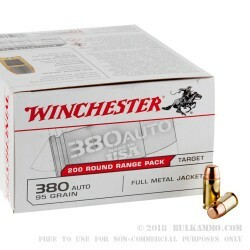 For convenience, the case breaks down into five Range Packs which contain 200 rounds each. 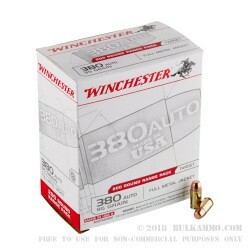 Winchester is one of America's top manufacturers and is recognized for their affordable prices, quality components, and a wide array of products that can meet every need. Their ammunition is tuned to the latest trends and supported by over a century and a half of experience.